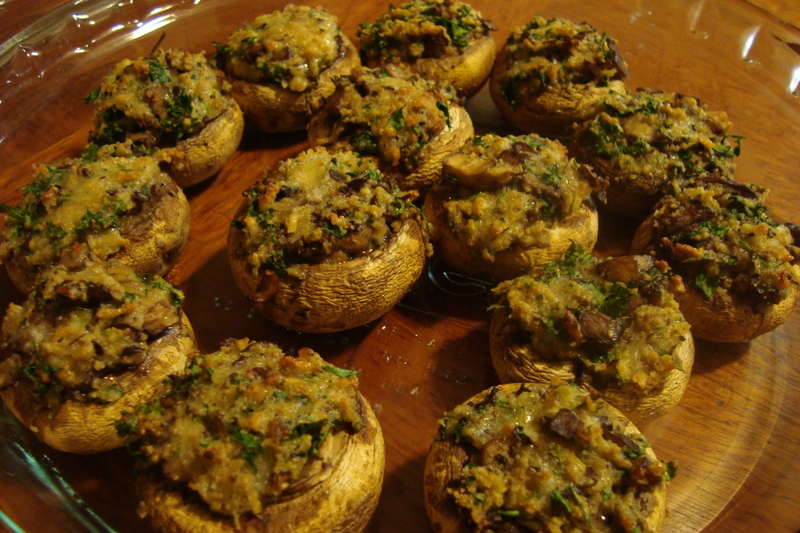 Stuffed mushrooms are really easy to make, and you can stuff them with almost anything you have on hand. They are definitely one of my go-to hors d’oeuvres. This version is vegetarian, but I often incorporate sausage or bacon. 2. Remove the stems from the mushrooms and chop the stems pretty finely. 3. Heat a small skillet over medium heat with the butter and olive oil. Add the garlic and mushrooms, and saute until the mushrooms are soft. Season with thyme, salt, and pepper, then pour the red wine in and allow it to reduce. 4. 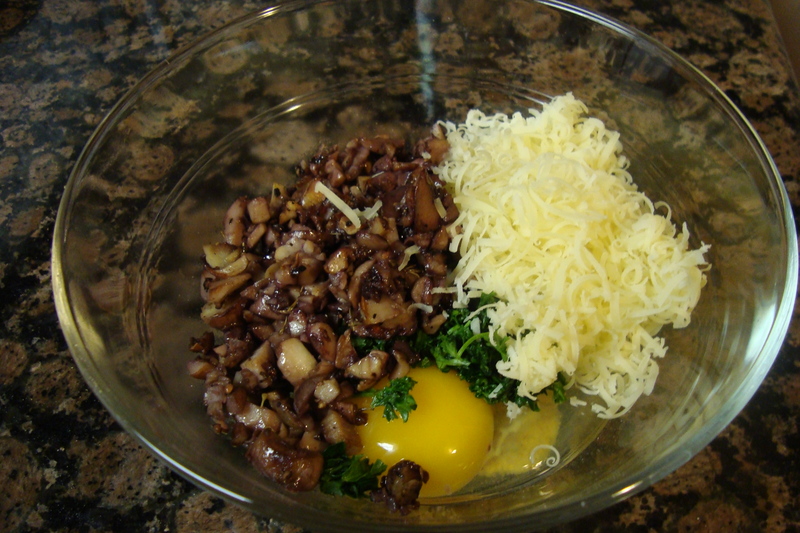 While the mushroom stems are cooking, add the egg, bread crumbs, parsley, and emmentaler to a small mixing bowl. 5. Allow the mushroom stems to cool. Once they are room temperature, add them to the bowl with the bread crumbs and egg. Stir everything to combine. 6. 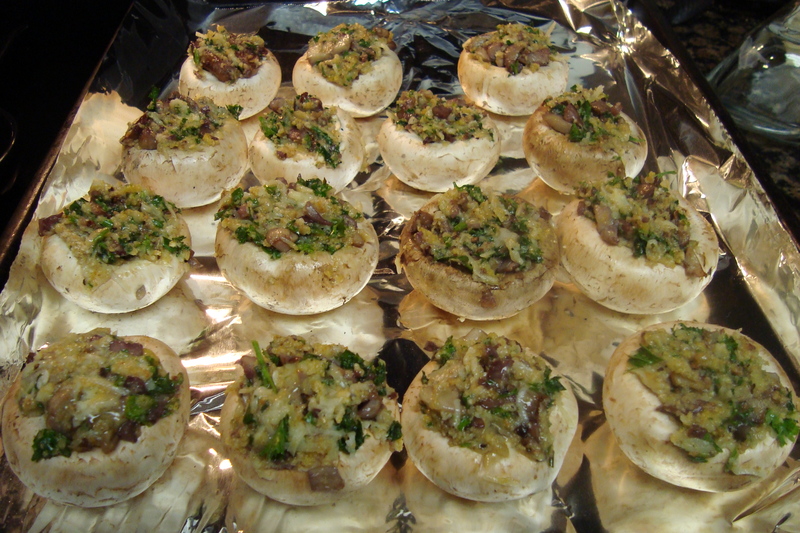 Put a spoon of filling into each mushroom cap. Rest them face up on a baking sheet, and bake for 25 minutes or until the mushrooms have released a little bit of liquid and the filling is golden brown. If you are going to take these somewhere, they are good room temperature as well. I come from a family of vegetarians (I’m the 3rd generation of crazy vegetarians) and stuffed mushrooms are key for every family get together. Love them! Yum! If I were a vegetarian I think I wold make giant entree-sized ones with portobello mushrooms. Actually, I should try making those anyway!